The Spunkflakes took to the streets to March For the Alternative yesterday in central London, masquerading as Conservative Party grandees Margaret Thatcher, David Cameron and Eric Pickles. Support the Cuts. More Cuts. Deeper Cuts. Workhouses for the Poor. No schools for Children. No pools for Anyone. No overtime for the Police. Pensions only for the Rich. Maggie, Maggie, Magie! Die, die die! Hope you enjoy these little video clips of our lovely day out. Tory grandees Margaret Thatcher, David Cameron and Eric Pickles are mobbed by a gang of anarchist protesters near Trafalgar Square. David Cameron, Maggie Thatcher and Eric Pickles check the Police’s overtime sheets down Piccadilly. What a Pickle: Thatcher & Cameron pop into Fortnum & Mason for a quick break. 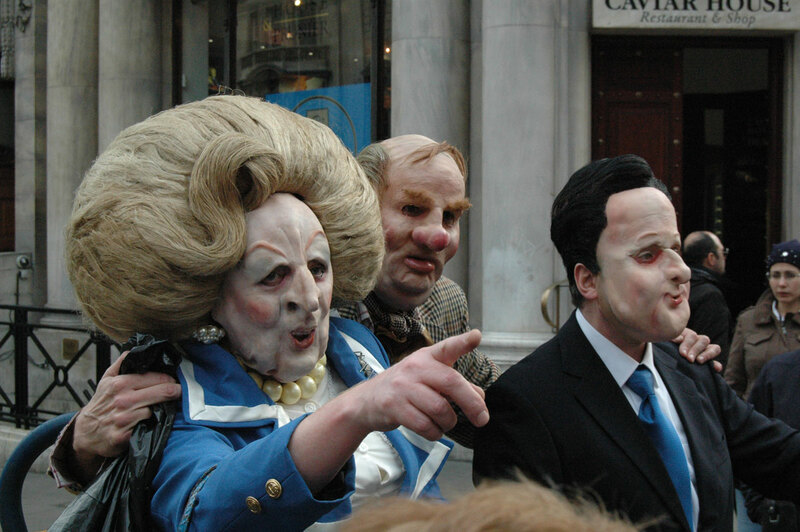 Maggie Thatcher, Cameron and Pickles draw boos and jeers as they support the cuts on the March for the Alternative. Big thanks to our cameraman Trevor Watson who fought through the mobs for the footage. Also, check out Flickr for our Tories March for the Alternative photo set, plus a few galleries with photos taken by others on the 26March.